Draft: 2015, Texas Rangers, 7th rd. Dylan Moore…resides in Yorba Linda, CA…graduated from El Dorado (CA) High School, where he hit .446 as a senior…after leading Cypress College (CA) to the CCCAA State Championship as a sophomore, transferred to the University of Central Florida…posted a .323/.401/.471 slash line in 112 career games over 2 seasons at UCF. The Totals - Split the season between Double-A Biloxi (24 G) and Triple-A Colorado Springs (97 G), combining to hit .299 (122x408) with 70 runs, 31 doubles, 9 triples, 14 home runs, 58 RBI, 35 walks and 23 stolen bases in 121 games..Movin' - Released by Atlanta, March 30…signed a minor league contract with Milwaukee, April 2...Fast Start - Opened the season with Biloxi and reached base safely in 22 of 24 games, batting .373 (31x83) with 12 runs, 7 doubles, 3 triples, 3 home runs, 18 RBI and 6 steals...Moving On Up - Promoted to Triple-A Colorado Springs on May 10 and spent the remainder of the season with the Sky Sox…in 97 games, hit .280 (91x325) with 58 runs, 24 doubles, 6 triples, 11 home runs, 40 RBI, 28 walks and 17 stolen bases...Starring Role - Named to the PCL All-Star team…went 0-for-1 with 1 run and 1 walk...Leaderboard - Among PCL leaders, ranked T12th in triples and T14th in stolen bases. 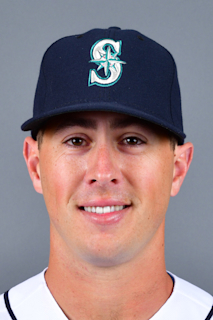 November 9, 2018 Seattle Mariners signed free agent 3B Dylan Moore. November 2, 2018 3B Dylan Moore elected free agency. October 9, 2018 3B Dylan Moore assigned to Tomateros de Culiacan. October 9, 2018 Tomateros de Culiacan placed 3B Dylan Moore on the reserve list. May 10, 2018 Dylan Moore assigned to Colorado Springs Sky Sox from Biloxi Shuckers. May 3, 2018 2B Dylan Moore assigned to Colorado Springs Sky Sox. April 6, 2018 2B Dylan Moore assigned to Biloxi Shuckers. April 2, 2018 Milwaukee Brewers signed free agent SS Dylan Moore to a minor league contract. March 13, 2018 IF Dylan Moore assigned to Atlanta Braves. February 26, 2017 SS Dylan Moore assigned to Atlanta Braves. September 16, 2016 SS Dylan Moore assigned to Salt River Rafters. September 8, 2016 SS Dylan Moore assigned to Mississippi Braves from Carolina Mudcats. August 26, 2016 SS Dylan Moore assigned to Carolina Mudcats. August 24, 2016 Texas Rangers traded SS Dylan Moore to Atlanta Braves for Other Considerations. August 4, 2016 1B Dylan Moore assigned to High Desert Mavericks from Hickory Crawdads. March 17, 2016 IF Dylan Moore assigned to Texas Rangers. September 4, 2015 SS Dylan Moore assigned to Hickory Crawdads from Spokane Indians. June 16, 2015 SS Dylan Moore assigned to Spokane Indians. June 12, 2015 Texas Rangers signed SS Dylan Moore.